Sketches of Canada for October 14th! Winnie the Pooh, a Canuck? Well of course SHE was! This Canadian History for Kids, Sketches of Canada, looks at Harry Colebourn and the little black bear cub that would become famous all over the world. This Canadian History for Kids article begins when there was a little black bear cub that became an orphan when a hunter killed her mother. She was found by a trapper who brought her into White River, Ontario. Lieutenant Harry Colebourn, was attached to both the Fort Garry Horse Regiment and the Canadian Army Veterinary Corps. He bought the little bear for $20. He was headed for Val Carteir, Quebec and then on to England. Harry was born in England and came to Toronto, Ontario, Canada when he was 18. He later moved to Winnipeg, Manitoba. Harry decided to name the little cub “Winnipeg” after his hometown. This little bear, known as “Winnie” became a pet for the soldiers, sleeping under the cot of her master even after they reached the Salisbury Plains in England. This Canadian History for Kids article continues in 1914 when he received the news that he would soon be shipped to France. He knew that Winnie would not be able to go with him, so he made arrangements to keep her in the London Zoo until he returned. Winnie soon became a favourite attraction. People would knock on her door and she would open it and come out. She would allow children to ride on her back and she would eat from their hands. 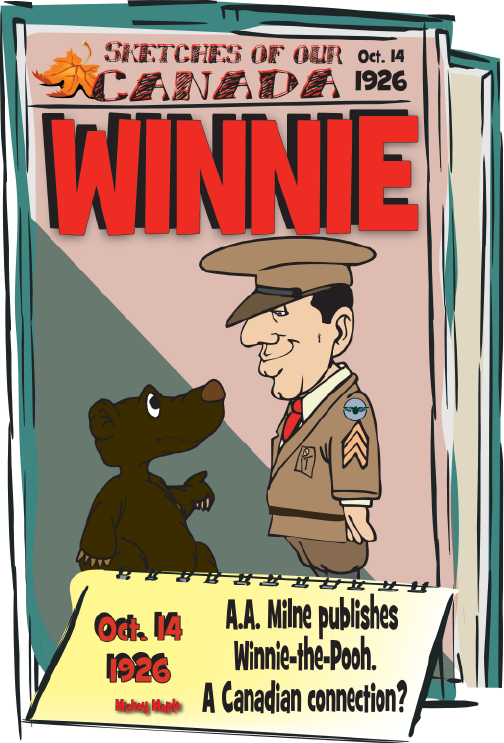 Colebourn visited Winnie at the Zoo whenever he was on leave. When Harry saw how popular she was with the children and adults, he decided he would not take her back to Canada as he had planned. She was officially donated to the Zoo on December 1, 1918. This Canadian History for Kids article continues when Writer A.A. Milne and his son Christopher Robin Milne became frequent visitors and it was Christopher who added “Pooh” to Winnie’s name. He got the name from his pet swan named Pooh. A.A. Milne started to write stories about a loveable bear in his children’s books based on that bear in the Zoo. In his first edition in 1926, he mentioned that these stories were about this bear and his son and his son’s stuffed animals. This Canadian History for Kids article continues with how a bronze statue of Winnie now stands at the London Zoo in her memory. It was unveiled in 1981. Part of the inscription reads “She gave her name to “Winnie-the-Pooh” and A.A. Milne and Ernest Shepard gave “Winnie-the-Pooh” to the rest of the world”.